At this time the Turzansk marriage records are being researched to possibly find the parents of Maria Senko who was born ca. 1878. Senkow is her actual family name. There are no Senko family names in the Turzansk parish registers but the cadastral records do have Senko surnames. No record of Maria’s birth exists (either on LDS microfilm or in the Poland State Archives) and therefore the names of her parents are not available. The Turzansk marriage records which are on the LDS microfilm only cover the registration of marriages for 1784 to June 1870. In Poland they are searching for Senkow marriages which occurred during July 1870 – 1874 while marriage records after 1874 do not exist. The marriage of Hrehorius (Gregory) Senkow and Eva Uhryn. I suspect that Gregory (Hrehorius or Gregorius in Latin; Hryhoriy in Ukrainian/Rusyn) is Maria’s uncle. In the US most persons with the Hryhoriy were called “Harry”.They married in 1860 and their marriage record is attached. The Senkow family house number is 55. Not all lived in the same physical house, but in cottages/houses associated with the original main house. In the Turzansk vital records (deaths, marriages and births going back to 1784), the priest associated all Senkow names with house number 55. It is then assumed that the origin of the “Senkow household/clan” was house number 55 and then as the land of the primogenitor was parceled for descendants; cottages were built. The cottages were associated with house number 55. The LDS microfilm only has deaths for 1784 – 1854. The death record research can’t be done in Poland either because Poland archives also only have Turzansk deaths registrations through 1854. Maria may have had a brother called Michael, who was born before 1866. The LDS microfilm has births through 1864 but no birth record was found of Michael Senkow. The birth register books did contain some badly damaged pages which were torn, unreadable and had water damage. Thus, many birth records are not available. Possibly, Michael Senkow could have been born after 1864 and Poland archives has no birth records for 1865 – 1880. Poland archives have births 1881 – 1903. In those books it is possible to find younger siblings of Maria. More research is underway in Poland to find other possible parents of Maria Senkow, born in ca.1878. The marriages during July 1870 – 1874 and births during 1881 – 1903 are being examined to find other candidate parents at this time. In Turzansk are also surnames Symkow/Simkow, which makes the research difficult, i.e. one never knows if the priest made a mistake in spelling. The Senkow family occupied house number 55 while the Symkow family seemed to have occupied house numbers 32/33 and 21. If records are found they will be included in this space. Bobbie Wartella (Bobbie was an Americanized name for grandmother, it came from the Polish word baba) was born in Turzansk, about five miles south southeast of Plonna where Nicholas was born (See Map). The 1787 Austrian List of Surnames of Turzansk lists Senko at #32. John Mazur, a nephew of Bobbie, was taken in by his aunt in 1930. He came from the same town (#23). Bobbie Wartella arrived on the Rotterdam ship from Hamburg, Germany to Ellis Island, New York in1897, approximately three years after Nicholas arrived. Because of the villages being so near each other and both families living in their respective villages for over one hundred years, it is probable to say the Senko and Wartella families knew each other many years. It is possible Nicholas knew Bobbie from “the old country,” then sent for and paid her passage to the US. It is possible the marriage was a planned marriage arranged by both families. It is also, possible that Bobbie living with the Thier family in the Heights of Wilkes-Barre met Nicholas at the Holy Resurrection Russian Orthodox Church. No matter, they were married May 15, 1898 at St. Peter and Paul Ukrainian Greek Catholic Church in Plymouth, Pennsylvania.They lived in a rented home at 24 Center Street, Kingston, Pennsylvania. 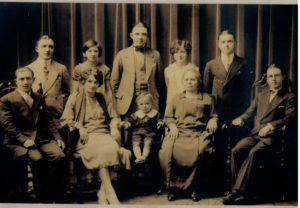 Their first son Stephen was born in 1899. About this time, Nicholas and Mary joined the Russian Orthodox Church. The 1900 census records a Meary Rutela, wife of Nick, living on Green St., Edwardsville, and had a year old son Steve. Meary born in January 1878, was 22 years old and was married 2 years. She was the mother of one living child and came from Austria-Hungary. 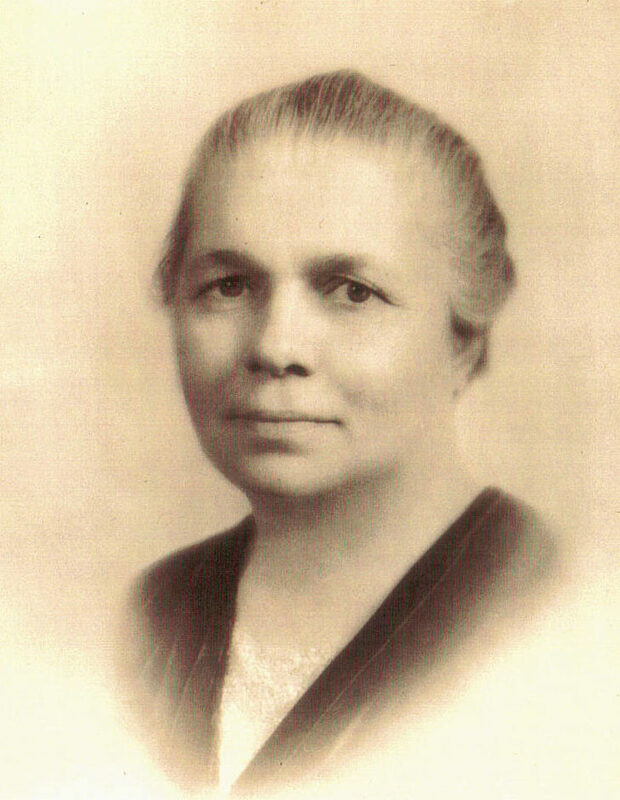 Her son Steve was born in August 1899 in Pennsylvania. The census taker put down what was heard. “Wartella” was written down as “Rutela.” Bobbie and Nicholas had nine boarders (Wassil Kronick-Age 13, Peter Demshish-Age 37, Mike Hinesky-Age 30, Metro Bosarabo-Age 20, Ritz Matzerura-Age 30, Evan Gabish-Age 30, Wassil Sickalla-Age 16, Metro Shopyeck-Age 30, Mike Konick-Age 17) living in their home. They were single men all recently arrived immigrants who worked in the mines. They boarded four to five men to a room. Bobbie cooked 2 meals, breakfast and dinner, for 12 and laundered their mining clothes every day. The miners worked 6 days a week,11 hours a day. Wages were paid at $1.50 per ton and it took 4-5 mine cars to make a ton. Miners worked in pairs so the $1.50 was split between the two miners. Sunday was their day off and everyone went to church. Bobbie cooked one large meal on Sunday after church. In 1901 they moved to 100 Hillside Ave. Edwardsville where Michael in 1901 (my dad) and Metro in 1903 were born. In 1904-05 they bought a house at 73 Armstrong St. Edwardsville where Nicholas (1905) and John (1908) were born. All children were baptized in the Russian Orthodox Church in Wilkes-Barre. The 1910 Census stated that Mary Vartilla, wife of Micheal was 32 years old (1878) was married 12 years (1898) Mother of five children, all living. She emigrated from Austria-Russian in 1897, spoke Russian (Lemko dialect) and was not employed. She could not read or write English. Her sons were: Stephen, age 12, born in the US, spoke English, was not employed, could read and write English and attended school. Michael, age 9, born in the US, spoke English, was not employed, could read and write English and attended school. Metro, age 7, Nicholas age 5, John age 2 were all born in the US. Also, there were three boarders who lived in the house (John Novendofski-Age 20, Philip Konanguko-Age 30, Koasta Stappi-Age 19). All single men immigrating from Austria-Russian, employed as coal miners, spoke Russian (Lemko dialect) and could not read or write English. Anne (born 1911) and Julia (born 1913) the youngest of seven children lived on Armstrong Street. The house had six rooms which housed the family of nine and at times up to eight boarders. With pigs, chickens and cows to feed, Bobbie continued to prepare meals and launder everyone’s clothes. The 1920 Census states that Mary Wortilla was 42 years old and came from Galicia to the US in 1897 and her mother tongue was Ruthinian. Their oldest Stephen was 20 years old and worked as a brakeman for the coal company. Michael who was 18 worked as a motor runner in the coal mines and Metro who was 16 was working in a silk mill. Nicholas (14), John (12), Anne (8) and Julia (6) were all in school. No boarders were listed as living with them at the time. In 1924 they moved to 215 Jackson Street a few months before the wedding of Steven and Tillie Lukachik. 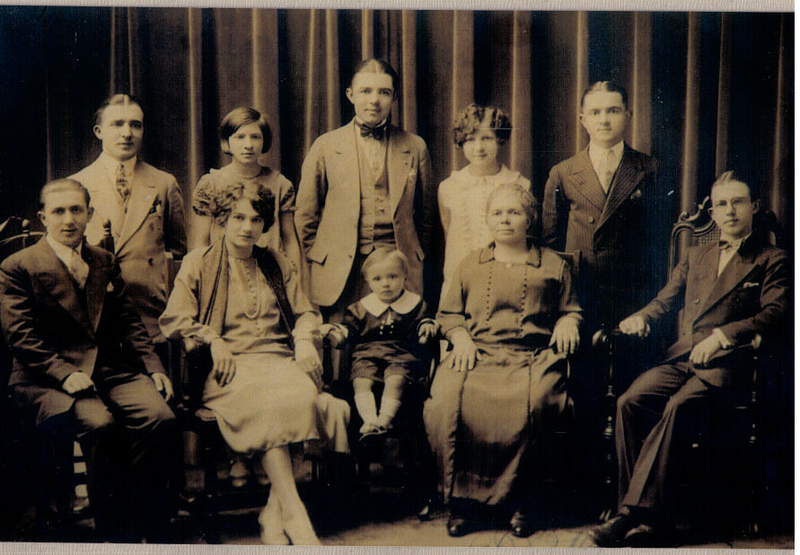 When Nicholas died in March of 1926, Stephen became the head of the household but Bobbie was the matriarch of the Wartella clan. A strong and proud woman who felt she was successfully established in the community supposedly emphasized her status by hiring a chauffeur to drive her expensive car. It was said she could not speak English but had a chauffeur. Metro driving the Wartella truck delivering meat and groceries to those who could not make it to the store. “Reflections Of My Grandmother” by Dr. Stephen Wartella Jr. Page 1, Page 2, Page 3 and Page 4. Michael (Nicholas’ brother) who was a professor at the University of Kharkiv in the Ukraine asked Bobbie if her son Michael (my dad) would come to Europe to study Physics under his tutelage. Bobbie the matriarch of the family would not allow any such thing as allowing her son to leave the country. More Bobbie Wartella narratives can be read herein on Julia and Metro’s web pages. After several bouts of pneumonia she died on December 24, 1956.